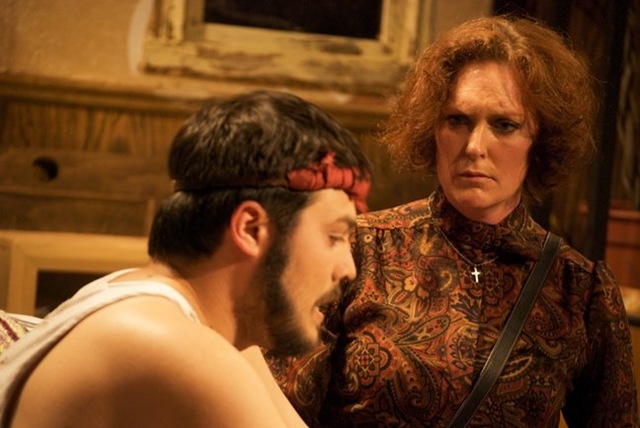 Now in their sophomore season, Mortar Theatre Company is obviously drawn to new work that digs into quagmires of social ills, usually presented in an epic, sprawling fashion. 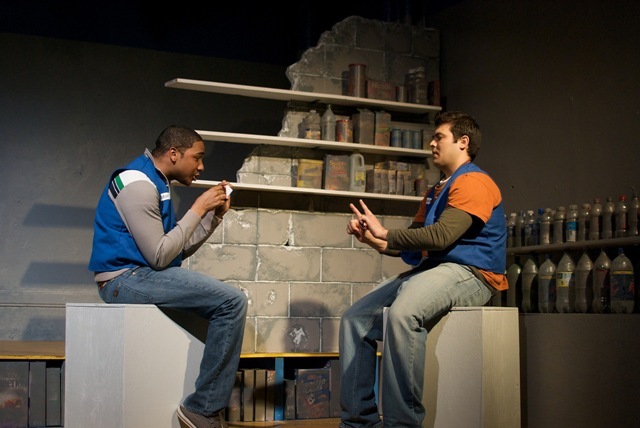 Last year’s Under America (our review), for example, presented a complex, multi-tiered tale about the now demolished Cabrini Greene housing projects along with a Dante-esque trip through the American prison system. Their latest project, the Midwest premier of I Am Montana by Samuel D. Hunter, takes aim at big box retailers and how they treat their labor. They even have “minimum wage” Thursdays, where admission equals the running time times the national minimum wage ($7.25, although it’s $8.25 in Illinois). The treatment of non-union unskilled labor is often ignored in the arts, but it’s an important issue that involves millions of Americans. The subject seems dry on paper, but director Rachel Edwards Harvith and her cast tell an engaging, layered web of a story. Unfortunately, Harvith and Hunter’s efforts are blunted by an inability to articulate what the piece wants to be. I Am Montana feels unfinished, delivering a collection of loosely-tied ideas and not-quite-cooked characters. 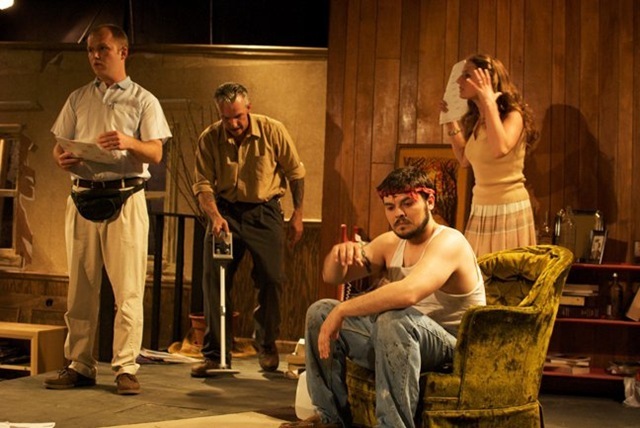 Hunter can’t decide whether the play is a hard-hitting human drama or a darkly surrealistic take on modern Americana. 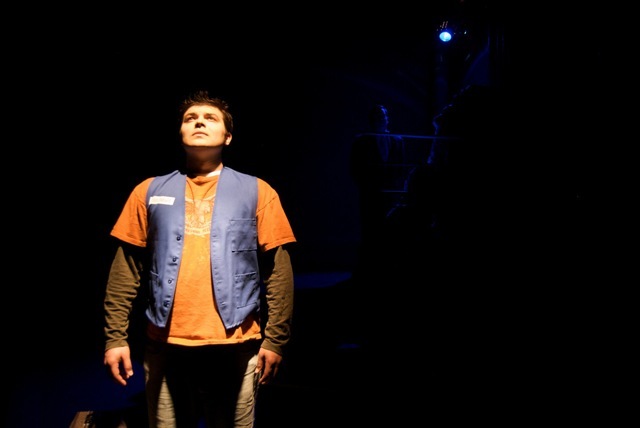 Hunter focuses his play around the tribulations of Eben (Derek Garza), a Montana boy who left to fight in the Israeli army. Now mentally disturbed, he punches a clock at Valumart, a Wal-Mart style retailer with thousands of locations dotting the new American landscape. 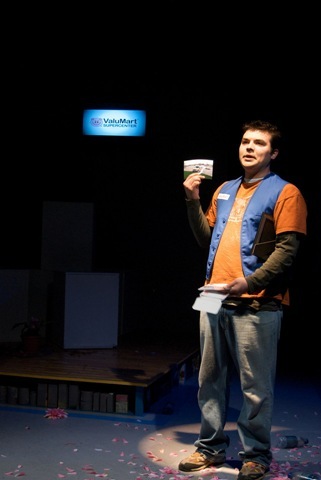 We watch his winding journey to a Valumart convention, where he’s been selected to speak about the future of business. He’s joined by his childhood friend, the fabulous Tommy (Sentell Harper), and a meth head/obsessive personality, Dirk (Josh Nordmark). The trio drive, sleep, fight, and eat cheap meals on Valumart’s tab. We learn that Eben, who slowly reveals the horrors he went through in the army, obviously has far more sinister plans for the convention than a speech on retail. Part of the problem is that Hunter leaves plenty of questions with unsatisfying answers. How and why did some dude from small-town Montana end up fighting in the Middle East, and then end up back home working an entry level position? A handgun is stolen from a Valumart, but why are there are no repercussions? And why did Eben’s boss choose three of the least-suited employees to talk to the big boys about profits and expansion—subjects Dirk, Eben, and Tommy care very little for? And a lot of the twists can be spotted a mile away—especially Eben’s evil scheme and his darkest war secret (it’s grotesque, but predictable). Garza, Harper, and Nordmark have a great chemistry throughout the production, each knowing how to alternatively console and berate the others. 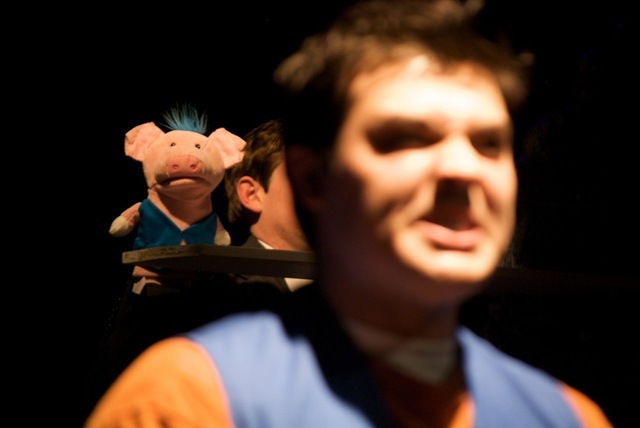 Nicholas Roy Caesar also does fine puppet work as Valupig, Valumart’s porcine mascot. Harper obviously has a stronger connection to the giddy Tommy than to the hardened convicts that filled Under America. The timing and vulnerability of the cast are what really bring the production home. I caught myself wondering if Eben, Dirk, and Tommy would ever go to the theatre. If they did, I bet they would enjoy the screwed-up moments of I Am Montana, and they would probably pine for more weirdness over social commentary. I Am Montana continues through May 1st at the Athenaeum Theatre, with performances Thursday-Saturday at 7:30pm and Sundays at 3pm. Tickets are $18-$20, and can be purchased online. For more info, visit mortartheatrecompany.org or download the program. Jacob Juntunen deserves some props for diving headfirst into territory many writers nowadays fear to tread—the world of epic theatre. Juntunen’s newest play for his Mortar Theatre cohorts, Under America, spans months of time and travels through a smorgasbord of locations, some realistic, some surreal. Clocking in at just under three hours, it’s safe to say the play tackles a lot. Unfortunately, the ambitious piece tries to knot together too many threads, and Mortar’s production teeters a bit too close to chaos. Under America is mostly about the Cabrini-Green public housing development and one journalist’s (Stephanie Stroud) attempts to understand issues that belie so much poverty in this country. Her story is interwoven with the tale of a youth from Cabrini-Green (Jon Sharlow) finding himself awash in the judicial system. Through time spent in solitary confinement, he discovers a prison wardrobe-to-Narnia which transports him to a bizarre system of tunnels brimming with strange characters “under America.” We also get to see how Sam deals with the boy’s family as well as her lawyer girlfriend, disconnected mother, and right-leaning father, who also happens to be a politician. Juntunen sets out to tell a big story, and this one is gigantic. 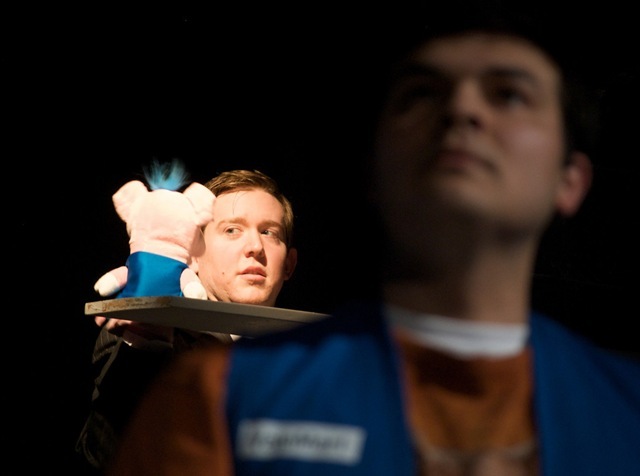 The play unravels due to a lack of focus. Angels in America succeeds so well because all the stories plug into each other thematically. Here, it is less compelling. Some storylines could be tossed out completely without shattering the macrocosm; Sam’s struggle to come out of the closet to her parents comes to mind, or any of the scenes with Jackie (Jazmin Corona), a social worker who gives a handful of opinions on Sam’s relationship and the social health of the country at large. The weaker character relationships should be weeded. They provide some interesting nuances, but don’t have the life-or-death gravitas that the driving issues tap into to keep the audience interested. Basically, the stakes vary widely. For me, the most interesting section of the show was the dark, weird journey to the mythical belly of the American prison system. Michael, the young man, goes below, looking for his father through layers of hallucinations, doing the bidding of a cat-obsessed inmate and stoic warden, among others. The trip, which comprises most of the second act (of three), is unnerving, unpredictable, and fascinating. It was the tale I wanted to watch play out most of all. For her part, director Rachel Edwards Harvith clicks with the script. Even with fistfuls of characters and plots, she never ignores a single one. Her dedication to the script comes through in every scene. The waves of information could’ve been better shaped, though, and she should have picked certain ideas to really stick to the audience instead of letting them all surge over us. As a unit, the cast comes across as wooden. 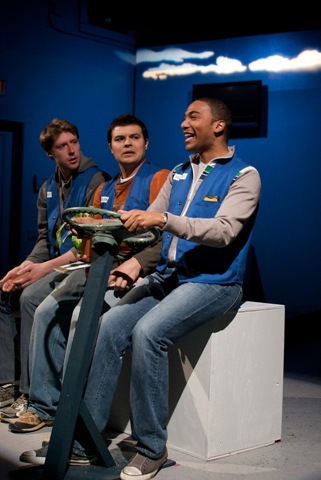 Some of the individual performances are magnetic, like Sharlow, Stroud, and Sentell Harper (who plays Michael’s brother). The group scenes ring hollow; the actors can’t keep their connection over the entire show. William J. Watt, however, deserves a special mention for his performance as Rob, Sam’s father. He gives charisma and caring to a character that could easily be stereotyped and set aside. He’s not the only talented one on-stage—there are some great moments dotting the production, but as a whole, the acting is inconsistent. Let’s not forget that this is Mortar Theatre’s second production ever. They are a ballsy group of artists for sure. Even though Under America might get ensnared in its own web, there is a lot of talent and intelligence at work. They like to ask big questions and explore unique perspective—one hypothesis in the show links products manufactured by prisoners to concentration camps, for example. With some more generous use of the backspace button, Juntunen and company could easily hit gold with their upcoming season.